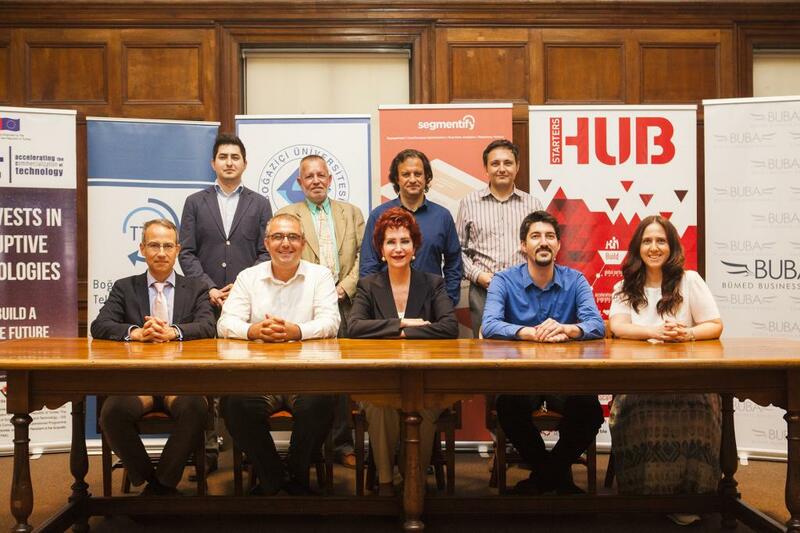 Segmentify, developed at the HayalEt Incubation Center operated by the Technology Transfer Office of Boğaziçi University, received an investment of 200,000 Euros from ACT funds and 100,000 Euros from StartersHub to support its opening to global markets. Segmentify tracks visitors of e-commerce sites and their behavior, shows them the right product at the right time and increases conversion rates; it also recommends smart products to over 20,000 e-commerce and content sites in four different countries. Segmentify was developed by the HayalEt Incubation Center and entered the global market with 300,000 Euros in funds. It is a big data-based software product that provides conversion optimization through recommendation of smart products and was established by Murat Soysal and Ergin Eroğlu. The technology of increasing conversion and profit by tracking customer behavior on websites by means of smart algorithms and recommending the right product to the right customer at the right time is already being used in four countries. The development of Segmentify started when the founders converted the algorithm they had developed during their academic studies into a product idea to meet a need they noticed in the e-commerce and content firms they worked for: the need for “Personalized Websites”. They were supported by the HayalEt Incubation Program of BU’s Technology Transfer Office. While its establishment as a legal corporation was being done by the “Girişim Evi” project of the Turkish Economy Bank, Segmentify received a seed investment from BUBA, the Boğaziçi University Alumni Association’s Business Angels Investor Network, and benefited from the various types of marketing support offered by the “FikirÇarkı” and “GarantiPartners” programs operating in partnership with BUBA. In 2015, Segmentify participated in StartupBootCamp Istanbul’s acceleration program within the framework of StartersHub, and ultimately entered the growth phase. Today, Segmentify serves 20,000 sites in four countries. Segmentify also helps content sites increase their profits from advertisements by providing the most suitable content. ACT (Accelerating the Commercialization of Technology) was established as a technology based enterprise capital fund in July 2015. It is funded by the European Investment Fund (EIF) and some private investors. ACT provides startup support to technology based initiatives developed in Turkey and that have global growth potential; ACT can invest from 50,000 to 2,5 billion Euros per initiative. ACT works in close cooperation with its shareholders in universities, research centers, technoparks, and the entrepreneurial ecosystem, and has assessed over 600 initiatives and technologies since its inception. In addition to private investors, the TTA (Technology Transfer Acceleration Fund Project), an intermediary project of the EU’s Instrument of Pre-Accession Assistance (IPA) program, also transfers funds to ACT. The TTA is managed by the European Investment Fund (EIF), under the auspices of the Ministry of Science, Industry, and Technology and TUBITAK. Technology startups receive support and investments from StartersHub in every area they need to become growing, successful global firms. StartersHub has been supporting Segmentify, a participant in their acceleration program StartupBootCamp Istanbul, reach its growth targets by additional investments. Participation in StartupBootCamp Istanbul has accelerated the growth of Segmentify in terms of both customers and profit; Segmentify aims to enter the global market with the support of continued investments. StartersHub has invested 4.3 million TL to 23 initiatives they support; the number of initiative they support will reach 50 by the end of the year.